This topic contains 5 replies, has 3 voices, and was last updated by BowtomePhil 1 year, 6 months ago. I’ve had a e-bike for a few years and am considering upgrading to something thats a bit faster. Some of these questions may seem like things that should be simple/obvious but i’ve never had a vehicle faster than my ebike + i haven’t gone for my CBT yet so this is still in the planning stages. I’ve been looking at the City but i have a few questions. I’m only 5 foot – would i be comfortable on it? When would it need it’s first MOT and how easy is it to find a mechanic who can service it? And is there anything else i need to be considering? Feel free to throw advice at me i’m a complete novice looking for her first bike. I’d really like to go electric but i don’t know if it’s sensible when it comes to finding a mechanic if something breaks on it. I’m only 5 foot – would i be comfortable on it? – The City has a reasonably low seat height so you should be fine, I can measure mine at the weekend and let you know. What licence do i need to ride it – If you have a car licence obtained before 2001 you already have a full moped licence, if not you will need to do CBT. When would it need it’s first MOT – 3 years from date of registration. and how easy is it to find a mechanic who can service it?- They don’t really need any more servicing than a pedal cycle, and are very simple for anyone who can handle basic DIY stuff, alternatively any motorcycle dealer can do the basics, and any electrical/battery problems can be dealt with by motobility scooter or golf buggy dealers. When it does need an MOT would it need a specialist or will any motorbike mot place take it? And also is it easy to find good insurance for it? Any motorcycle dealer who offers MOT’s will be able to do it. 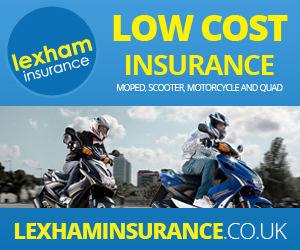 Most of us seem to use the same insurer (Lexham) as they know the E-Rider models and offer no hassle cover, there are no doubt others but the key thing is that they actually list the bike on their system otherwise they cant quote. Lexham seem to be the best. Get a couple of locks and give them the details and it reduces the insurance.